Dealing in Traded Options enables anyone to gain exposure in certain UK/US stock market equities and/or Commodity ‘futures’, without actually buying or selling the stock to which the Options relate. You can profit from Options in all situations (i.e. if prices go up, down or remain stable). You can start dealing with a very low capital investment. In fact you can even deal for a credit (although collateral is required in these situations). With careful planning dealing in Options can even enable you to buy stock at less than the market price and sell stock at more than the market price if you so wish. How a nil outlay produced £530.00 profit in a static market and could have been repeated anytime in a two year period. These are just a few examples of actual past deals, but similar opportunities and more are here NOW all of the time waiting to be acted on. My guide explains how to find them and how to profit from them. It doesn’t matter how many people start trading in Options (in fact the more the merrier), the opportunities will always be here now and in fifty years time, whether the economy thrives or sinks into a depression. It also makes no difference (to the amount of opportunities) which political party is in power – Traded Options are here to stay and they’re incredible! Let’s face it all of life is a gamble to a certain extent. On a roulette wheel, if you bet on ‘evens’ i.e. red; black; odds or evens etc, you will receive the odds of 1:1. But due to the ‘0’ and ‘00’, the balance is tilted slightly in favour of the casino (in fact just over 5%). This small but significant ‘trading edge’ is enough to make the casinos richer and the mindless punters poorer! You could say that playing the stock market is gambling in the same way as on a roulette wheel, and I must admit that the way some people do it, it is. But if it is executed intelligently (as you’ll see in my guide) and with the use of Traded Options, you can have a similar ‘trading edge’ to the roulette wheel, putting the odds significantly in your favour! To make consistent profits on the stock market without Traded Options, you’d have to be right at least 51% of the time all of the time. With intelligent use of Traded Options it’s possible to be ‘wrong’ considerably more than half the time and still profit. In fact you’ll see later how prices can move by as much as 20% in the wrong direction before certain positions become unprofitable. Furthermore you can learn the business at your own pace making ‘pretend’ deals before trading for real. This way you can be sure of your ability before investing a single penny. Can you think of any other business which allows you a free ‘trial run’ for as long as you want before fully committing yourself? – I can’t! 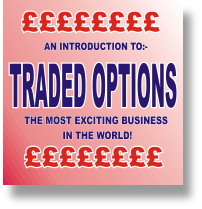 Everything you need to know about Traded Options is included in my guide - right from how the business works to making your first deal. Important: This is NOT a get rich scheme. If you want to make a fortune overnight you’d better carry on dreaming, but if you want a planned project which could make you very wealthy over a period of a few years without giving up your present job, or if you simply want a better return on your investments – then Traded Options is for you! Finally – Don’t be put off by the low price. I know that the normal price for this sort of info is £200 – £500 or £2000+ if you go to a seminar so this really is a bargain and if you’re not happy for any reason you can have a refund. How can I be fairer than this? The most Exciting Business in the world! ‘Small timer’ can make it BIG! Great this is worth every penny. great seller very helpful .